FTS is a worldwide leader in GOES communication. The CS2 GOES G6 is the standard GOES Transmitter that is in all new weather stations for the U.S. National Interagency Fire Center (NIFC). FTS was the first company to introduce GPS into GOES communication, and the first to offer HDR GOES data. 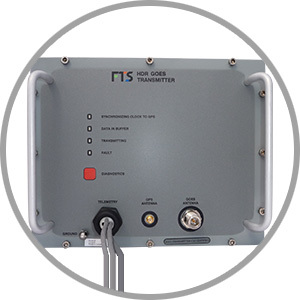 The GOES Transmitter has demonstrated industry-leading reliability with optimal operational characteristics for remote locations. In fact, FTS GOES technology forms the backbone of the National Climate Reference Station System. The G6 is certified by NOAA and by EUMETSAT for use on the Meteosat system. Extremely accurate timekeeping reliably transmits hourly data for up to 28 days without a GPS fix. Extremely low power requirements extend operation in situations of low power or interrupted solar panel charging. Automatically calculates GOES Antenna azimuth and inclination, speeding installation and eliminating errors. Supports test transmissions on an alternate test channel with fixed text messages to ensure future data transmission reliability. NESDIS ID testing is performed at the factory before each unit is shipped to further ensure that GOES transmissions will work perfectly. The G6 is available as an integrated option in the Axiom Datalogger, or as a separate unit for use with older FTS data loggers. The FTS GOES Transmitter operates on the GOES Satellite network. The GOES Transmitter is extensively field proven and has demonstrated industry-leading reliability with optimal operational characteristics for remote locations. Automatic reset and start-up (all configuration data stored in non-volatile memory). Provides diagnostic reports on forward and reflected power for on-site troubleshooting. The GOES Transmitter is available as an integrated option in the Axiom Datalogger, or as a separate unit for use with older FTS data loggers.